By Charles Moffat - November 2009. Step One: Find an alternator, motor or generator. This is what turns the kinetic energy into electrical energy. The cheapest way is to take an alternator out of an old car or truck and test it with a battery to make sure it still works. Some people even like to build their own, but I don't recommend that unless you are really into building things. Step Two: Build a propeller with three wings (sometimes called blades). Three seems to be the most efficient number. It doesn't have to be fancy, it just has to be lightweight and evenly weighted. You can use wood, plastic, aluminum, fibreglass, carbon-fibre, whatever you find handy and easy to work with. Step Three: Build something that will house the motor and keep it and all the wiring dry. The only things sticking out of it should be the motor's drive shaft and insulated wires. As part of this you will also need to build a thin flat fin that will allow the windmill to turn into the wind when it changes direction. Step Four: Attach the propellers to the motor's drive shaft. Depending on the size and shape of these parts you may need to build something to weld / bolt them together properly. You don't want the propellers falling off easily in a gust. I recommend using a substance called Loctite on any bolts. Loctite is a thread locking fluid commonly sold to mechanics of various types. Step Five: Use a pole or build some kind of base that will hold the finished aparatus high in the air. The apparantus on top will need to rotate somehow, likely on ball bearings. I recommend using a similar design to a bicycle because it will be water-tight. Don't forget to add an ample amount of grease so the ball bearings will move smoothly. One option would be to get your hands on an old flag pole. I recommend a galvanized steel pole because its resistant to rust and electricity, you can insert the wires down the middle of the pole and paint the pole any colour you want. ie. Sky Blue. The pole may also need to be held in places by three or four Guy wires depending on the tensile strength of your pole and expected wind strength. If you are buying your pole from somewhere try and find out what its tensile strength is. Step Six: Affix the pole or apparatus to the ground somehow. I recommend cement or concrete. Remember you will need to run the wires through a hole in the pole, either above ground or underground (I recommend underground, but inside plastic tubing) back to your basement or wherever your battery supply will be. Step Seven: Energy Storage... now we get to the tricky part. There are various batteries you can buy for storing household energy. They range in prices and you can buy as much as you want depending on how much you think you need. You will also need to buy a system that distributes electricity from the batteries back into your house. You will also need an Ammeter and Charge Controller to prevent overloading the batteries. Alternative #1: Store the energy kinetically by using it to pump water into a water tower high above ground, and then run a second generator from a tap that you can turn on and off as you wish. This is very much a do-it-yourself eco-friendly idea, but its not very efficient. You lose a lot of the energy you produced that way, and it will be difficult to store enough water to produce the energy needed to run a house off of it. This idea may sound good, but it doesn't actually work in practice. Alternative #2: Store the energy as hydrogen, by using hydroelectrolysis with water to syphon off the hydrogen, store it, and then use it later to run your house or a hydrogen car. This is rather expensive and complicated to setup however. Note: The battery solution mentioned further above is actually the cheapest, easiest solution out of the three. If you live in Canada you can buy the necessary batteries and equipment at Canadian Tire. Step Eight: Unless you live in a cottage and use very little energy one windmill will not be enough. Three or four windmills will be needed for an average house. Depending on the system and the availability of sunlight you could also supplement with solar panels. Another alternative is to cut down on your heating and cooling costs by installing a geothermal heating system (which in the summer can also act like an air conditioner). 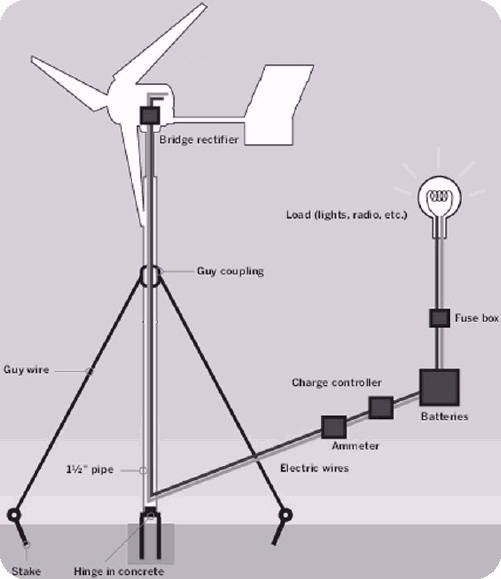 You may need to build your own little wind turbine farm if you want to be fully self-sufficient. If you are a farmer or own lots of land this will be easier to do. 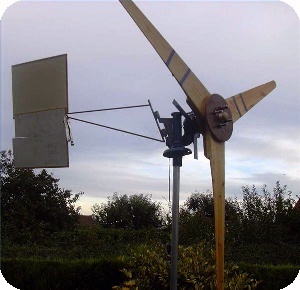 Depending on how you design your own windmill and what parts you use you will need a variety of different tools. Common tools used are: Hammer, Drill, Drillbits, Screwdrivers, Saws, a Bucket or Cement Mixer, Shovels, Pliers, Wire Strippers, Wire Cutters, Carving Knives / Chisels, Mallet, Adjustable Wrenches. If you already have 90% of these tools then you should be fine, otherwise you will need to determine which tools will do the job required on a case-by-case basis. 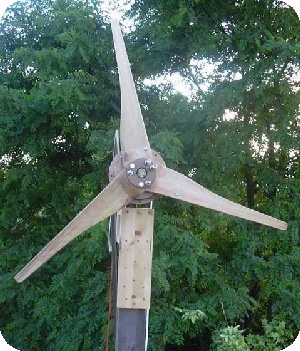 There are many ways to build a windmill and many things you could build it out of, including wood, metal, and plastic. 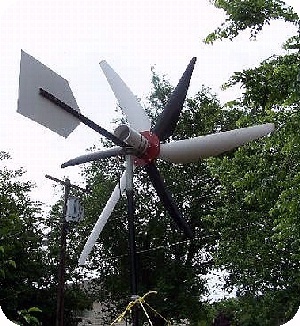 My recommendation is to look at a professionally built $3,000 windmill like the "Whisper 100 Wind Turbine" which produces 950 watts of power in 45 kmph winds, and then try to copy that design as best you can. You could just spend $3000 to get a top of the line windmill, but I would argue it is far cheaper (and can make an interesting hobby) to build windmills yourself. 1. 950W of power at 45km.hr winds. 2. 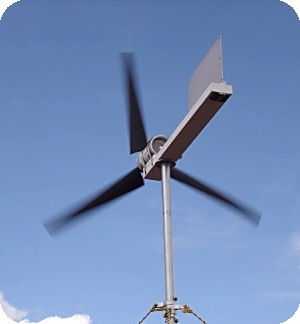 Delivers 100 Kw / hours a month at an average wind speed of 5.4 m/s. 4. One of the quietest turbines available. 5. Lightweight cast aluminum body houses integrated charge controller, which prevents batteries from overcharging. 6. Carbon fibre composite blades keep the turbine quiet and maintenance-free. 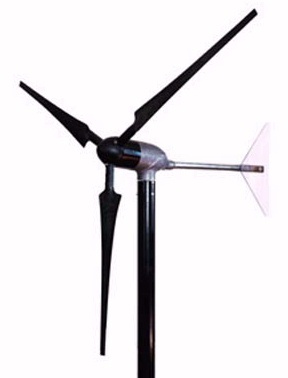 The Whisper is basically the best windmill you could buy for home use, but if you look at the parts all it is is a variable speed motor, 3 carbon fibre blades and quite a few of the basic parts are made out of aluminum. The most important things you would need to replicate is to find a motor that is identical (close enough or better quality) and the three light-weight wings. In North America windmills were first used to pump water for farms and ranches, and later to generate electricity for homes and industry. It was the quickest, easiest solution to providing energy at the time. Only later did hydro, coal, nuclear and solar power come into play. Industrialization led to a gradual decline in the use of windmills. Steam engines running on how water from coal or nuclear replaced windmills as the primary source of power. In the 1930s, the Rural Electrification Administration's programs brought inexpensive electric power to most rural areas in the United States. Industrialization also sparked the development of larger and more modern windmills and wind turbines to generate electricity. Such machines first appeared in Denmark as early as 1890. By the 1940s the largest wind turbine of the time began operating on a Vermont hill known as Grandpa's Knob. It produced 1.25 megawatts in 30 mph winds, feeding electric power to the local utility network. After World War II the popularity of wind turbines dropped because fuel and coal prices fell, making them the cheaper alternative. When the price of oil skyrocketed in the 1970s suddenly wind turbines were popular again. 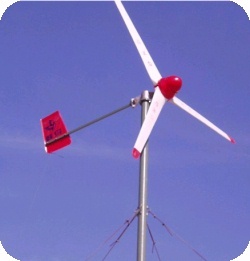 Wind turbine technology R&D (Research and Development) of the 1970s reintroduced old ideas, but with modern materials that made them more lightweight and efficient, as well as novel ideas like "wind farms" which have been growing in popularity ever since. Wind farms are large groups of turbines that feed electricity into the utility grid. Today wind-generated electricity is very close in cost to the power to conventional nuclear and coal utility generation in some locations. Wind energy is now the world's fastest-growing energy source and will continued to be used for generations to come. Problem #1: PEI's shores are slowly being eroded by the waves. Solution: Build breakers just off the shore in areas where shore erosion is most prevalent. Build windmills on top of the breakers (shorelines typically have higher amounts of wind anyway) with cables taking the power back to shore. Problem #2: European countries trying to claim parts of Canada's north. Solution: Have the Canadian military routinely travel to communities in Canada's north and help install windmills/battery systems. Eventually establish a wind-powered military look-out base at Canada's most northern point. Problem #3: Alberta using coal/natural gas to provide the energy to convert oil sands into oil. Solution: Install windmills in locations where plants won't grow (due to lack of moisture/soil nutrients). Problem #4: Deforestation in British Columbia causing erosion and mudslides. Solution: Build windmills in criss-cross patterns across the mountain side and plant new trees to replace those that were cut down. Problem #5: Remote regions of Canada's north rely upon gas-powered generators for electricity which is very expensive and a burden on the local economy. Solution: Build windmills in remote locations. Problem #6: Farmers who need electrical supply in their barns need to spend tens of thousands of dollars sometimes to get electrical wires installed so they can be attached to the electrical grid. Solution: Install windmills on the roof of the barn and solar panels. Don't bother attaching to the grid. Problem #7: The coal power plant at Nanticoke was built in the 1970s and provides approx. 15% of Ontario's energy but 21% of Ontario's pollution (Ontario is the 2nd largest source of pollution next to the Alberta oil sands). It is the largest coal-fired power plant in North America and one of the ten largest in the world. Solution: Nanticoke's staff of 600 engineers and workers could be used to manufacture and install windmills/solar-panels on the existing Nanticoke site, with the intention of eventually closing down the coal-burners one by one. Shutting down Nanticoke is the equivalent to taking 6.9 million cars off the road (there is approx. 6.5 million cars/trucks in Ontario) and will eliminate 30 megatonnes of annual greenhouse gas emissions.